I hope you all have had a great day and have taken time out to go the extra mile, beyond the ideals of a normal day, to show love and care to those you cherish; be it your family, significant other or yourself! Yes, yourself – because you’re worth loving. 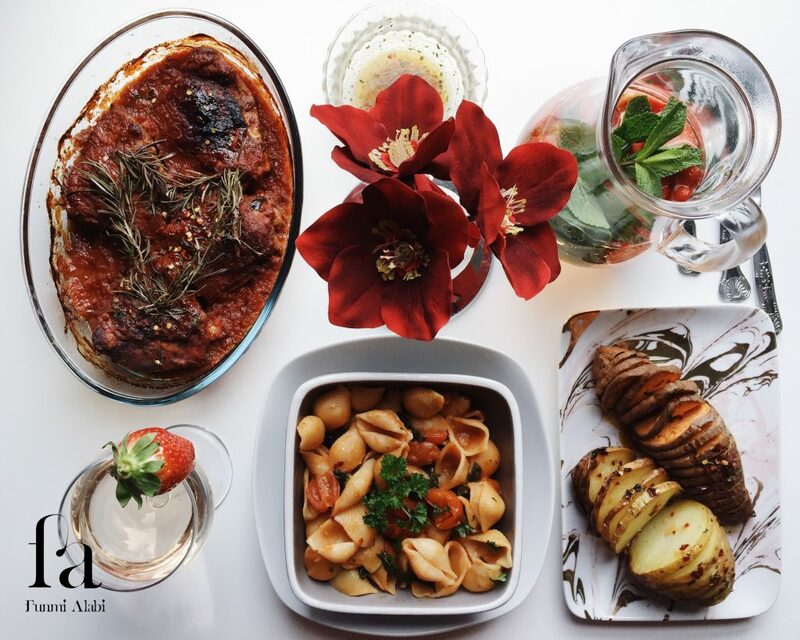 On today’s post, I’ll be sharing a recipe which depicts what my ideal date menu would have encompassed. Whilst it might be a glitzy idea dinning out, I very much appreciate being affectionate in the confide of one’s comfort. 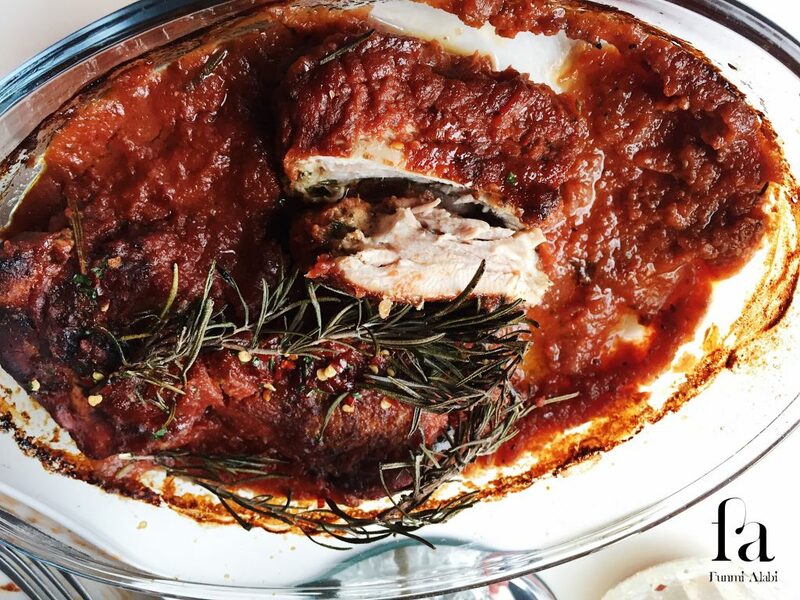 Today’s recipe is going to be the keynote of my menu – baked chicken in tomato sauce. It certainly is finger-licking good. Also important is the Tarantella’s Tomato Passata used. 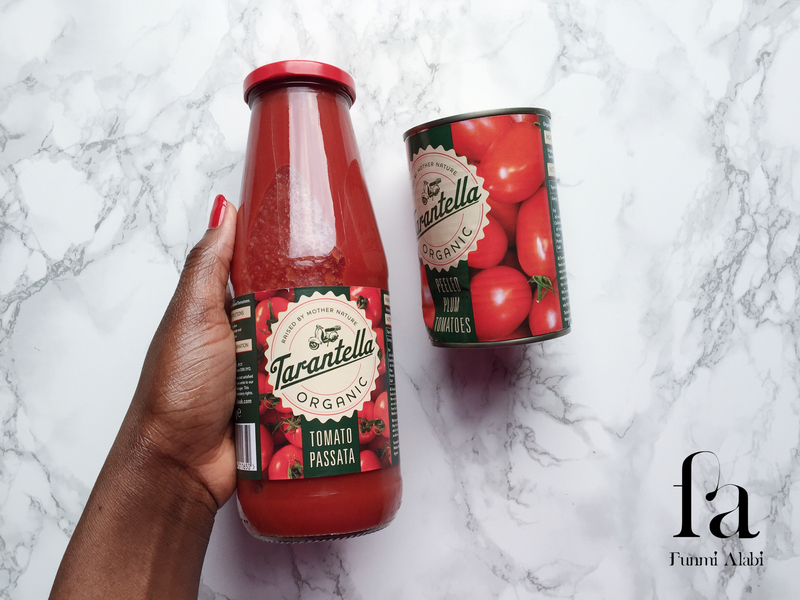 Tarantella are makers of organic tomato varying from chopped, peeled to puree – which are free from pesticides, addictives and GMOs. They have a real hearty Italian passion for food and their products are prided upon holding many health beneficial traits such as antioxidant lycopene with heart friendly qualities. I do like it and see myself using it over and over again. It has a fine blend and it is rich in taste. Also as February is our chosen month for health and fitness, the attributes of this brand ties in perfectly. So here you have it; feeding two, this can be made in about 60minutes. 2 Tsp Spices Each: Parsley, Curry Powder, Ground Spice, Oregano, Italian Seasoning, Turmeric, and Black Pepper. Clean your chicken leaving skin on. Be sure to rinse in lemon juice afterwards. Massage 1tsp of all seasoning and salt onto your chicken. After which in a hot oiled pan, slightly toast skin side. In a blender; add Tarantella tomato, chopped onion, scotch bonnet, garlic, ginger, fresh parsley and remaining seasoning, blending till it becomes smooth. As tomato is in liquid form, there is no need to add water for blender to run. In a baking dish, spread evenly a third of the tomato mixture which will act as a moist base for the chicken, also allowing the sauce to penetrate to bottom side. Lay the chicken on top, and cover with the remaining tomato sauce. 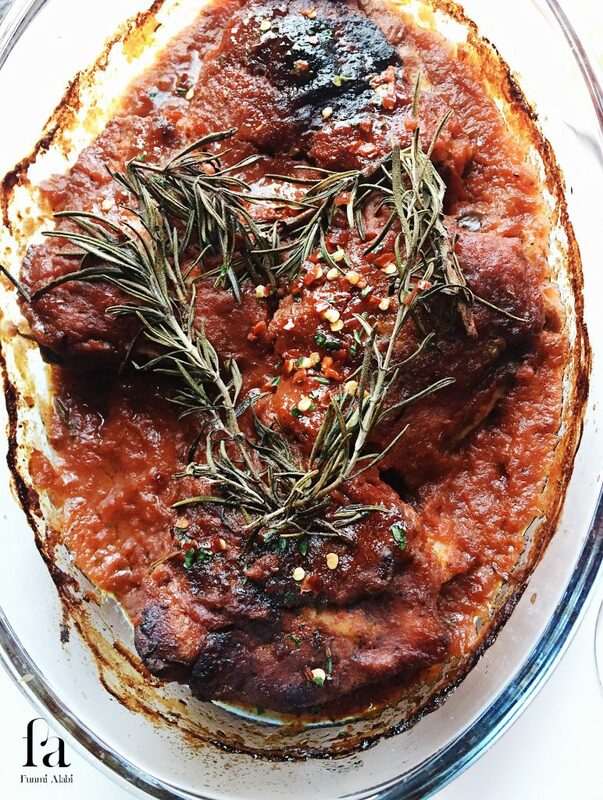 Lay rosemary sticks on top, I made a heart shape. Not only is this decorating, but it will also add a nice fragrance to the dish. Bake in the oven for about 40minutes. To ensure that your chicken remains as moist as desired, incorporate a water bath. To do this, place a pan filled with hot water at the base of the oven while baking is ongoing. The evaporating water is absorbed by the chicken as needed. Also, occasionally check your chicken. If you do notice some burning, cover the dish with foil which will manage the effect of the heat. 40 minutes later, your chicken should be done – well cooked and moist! There you have it! I hope these steps are helpful and the baked chicken, finger-licking. If you do try it out, please share with me; would love to see what you came up with. This recipe looks so delicious! Thanks for sharing! Looks super yummy! Thank you for sharing, Funmi. I will make it for my husband once. Delicious! Great and easy to do recipe! Thanks! Your recipes always look so delicious ! Thanks again for the recipe ! I’m loving these recipes!! This looks quite simple to make, I want to try! This sounds absolutely delicious! Your photography is stunning. What a delicious looking recipe! Thanks for sharing! I confess I don’t eat chicken, but I love tomato sauce and any dish with it is great! The pictures look great, really yummi! I can surely substitute the chicken for something else (I normally do that) and enjoy the spices of the recipe, like ginger! A lovely recipe! Hope you have a very nice weekend! It all looks so tasty, finger-licking as you said. Babe, you are such a cooking pro! This meal looks like something straight out of a 5 star restaurant. Thanks for sharing this recipe, looks and sounds good! This is a mouthwatering dish! I love your recipes, keep up the god work!